It didn't take Paolo Benedetti long to notice that his prospective client's house was giving way on a slowly collapsing hilltop. Armed with a fresh soils report, he designed a spa and stone deck that alleviated the slope's creeping -- and the homeowner's worries as well. Not long ago, I received a call from a young electronics entrepreneur who asked me to come and meet with him about the possibility of adding a swimming pool or spa to his multi-million-dollar hilltop property. The home had been built in the early 1960s, he told me, and he’d just completed a major remodeling project. He also indicated that he knew I was expensive, but that he’d already met with a number of other contractors and wanted to hear what I had to say. So I met him and we walked around the property. I wanted to know what he was thinking while I assessed the lay of the land. It didn’t take long for me to demonstrate why he was so lucky he’d given me a call. It all started when I noticed cracking in the stucco and foundation of one corner of the house – not a good sign with any substantial structure, let alone an expensive, freshly remodeled one at the top of a slope. I had a suspicion of what was happening and confirmed it by observing that the trees below the cracking corner all had inclinations -- they were actually leaning down the hill. Why had I noticed the cracking? It’s mainly because I’m a bit of a badger when it comes to sizing up situations, which is doubtless why I have a long history as an expert witness in construction-defect cases. Through experience, I’ve learned to open my eyes to what’s going on all around a damaged or defective watershape to determine the reasons why problems have arisen in the first place; I’ve also gotten to be very good at figuring out what needs to be done to make things right. With projects such as the hilltop home discussed in the accompanying text, I apply what I know as a form of preventive forensics – something my clients seem to appreciate, even when it affects a project’s cost. It was at this point that I had to explain to him what was meant by the term “slope creep,” the slow, steady movement of rock and soil down a hill. It wasn’t happening quickly, I said, but it was happening – and he needed to do something to stabilize the slope to avoid experiencing extensive damage to his home. I also let him know that any average watershape he might place atop that slope near the house was unlikely to help and more likely would accelerate the situation. To that point, none of the contractors he’d visited with had discussed anything like this issue with him. I have no idea why they avoided the subject, but I’m hoping it was simply that they hadn’t noticed. That’s my hope, anyway, because if those contractors had noticed the problem and decided to move ahead anyway without notifying the homeowner, it would be a serious breach of professional ethics and become another project that wouldn’t further the industry’s reputation. When I saw the damage at the corner of the house, I began looking around for other evidence that would help explain what was happening – and found it in the trees that were leaning down the slope. Once I’d apprised the homeowner of my observations, I advised him that we wouldn’t even begin the design process until he’d hired a surveyor and a soils engineer to examine the property and produce their reports. These experts, I told him, would determine if the house was still level, provide detailed topographical maps we’d need later and determine the current conditions prevailing with the soil and the slope. We started by digging down to the level at which we were going to set the spa and the decking, then brought in a drilling rig to cut through the soil and make room for the six caissons. With the holes dug, we craned the steel cages for the caissons over the house, moving them into position and carefully sliding them down into position. Once I had these reports in hand, I said, I’d be able to design and engineer a watershape that would not only serve the decorative and recreational purposes for which it was intended, but would also stabilize the home’s position on the slope and keep it on top of the hill where it belonged. Sometimes it hurts to be right: In this case, the survey and soils report taught the client more than he ever wanted to know about how seriously wrong things can go on a hilltop. According to the surveyor, one corner of the house was three-quarters of an inch off level. 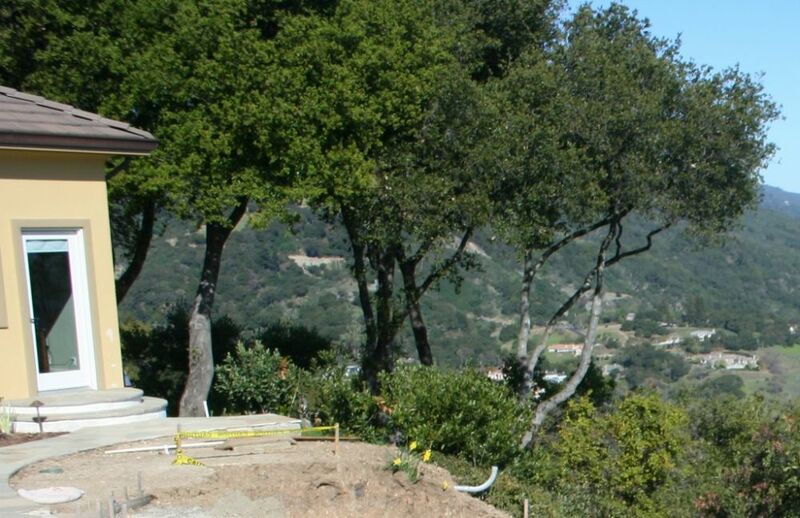 According to the soils engineer, that situation was bound to deteriorate: The lot was all cut and fill, with dirt from the home’s excavation and the flattening of the hilltop having been dumped down the slope and then merely pushed around to create level areas. There was no evidence that anything had ever been compacted or that any stabilization measures had ever been deployed. 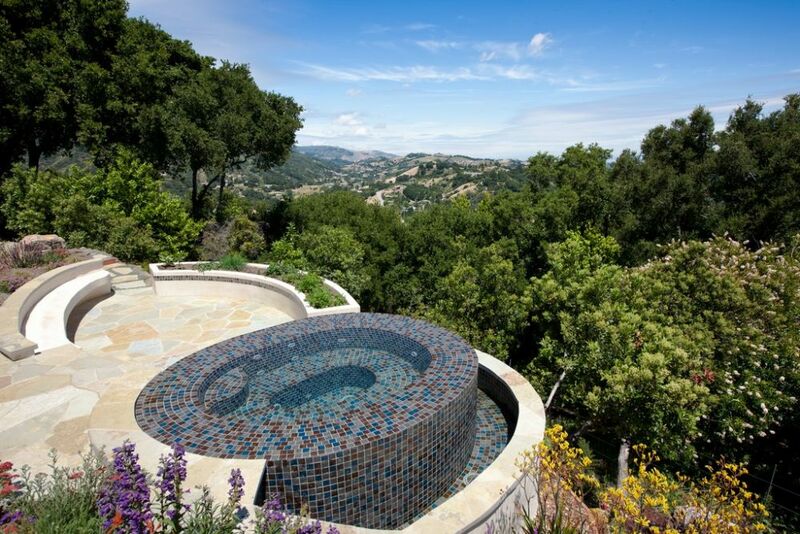 The client wasn’t happy, but he knew something had to be done to prevent damage to his house – and besides, he still wanted a watershape, although he ultimately scaled his thinking down from a nice, big pool to a nice, big spa. Once the concrete cured within the caissons, we set the framing and steel for the beams that tied the caissons together as a structural unit – and a completely stable support for the spa and decking. Armed with the reports, the engineering team at my company, Aquatic Technology Pool and Spa of Morgan Hill, Calif., quickly devised a conceptual plan that would give the client the outdoor spaces he wanted while securing the slope adjacent to the house. In addition, we planned to use grout injection to lift the corner of the house back into a level position and lock it there. The proposal we submitted represented an expense quite a bit larger than the homeowner had been anticipating, but the upside of the investment would be saving his house while gaining a beautiful spa, a sweeping seating area and a great herb garden. He saw the wisdom of the case we made, and we were ready to begin. After restoring the corner of the house to a level position, we went to work stabilizing the slope in proximity to the home. To do so, we inserted six caissons that reached down to stable soil, as identified in the engineer’s report. Atop those caissons, we placed a lattice of beams designed to support the spa and deck and allow for the inclusion of numerous planters. We backfilled around the beams, then set the framing for the spa and decks. We completed this project phase by preparing the plumbing system for the spa. We used a tracked excavator to drill the holes, then craned in steel cages to give the concrete caissons the structural integrity they’d need to withstand any shearing forces or slope creep. Once the concrete we poured into the deep holes cured, we worked atop the cages with confidence that there would be no more downslope motion. With the beams in place, we backfilled the newly terraced area, built the perimeter-overflow spa, finished it with tile from Lightstreams Glass Tile of Santa Clara, Calif., and surrounded the watershape with stone decking, benches and planters. 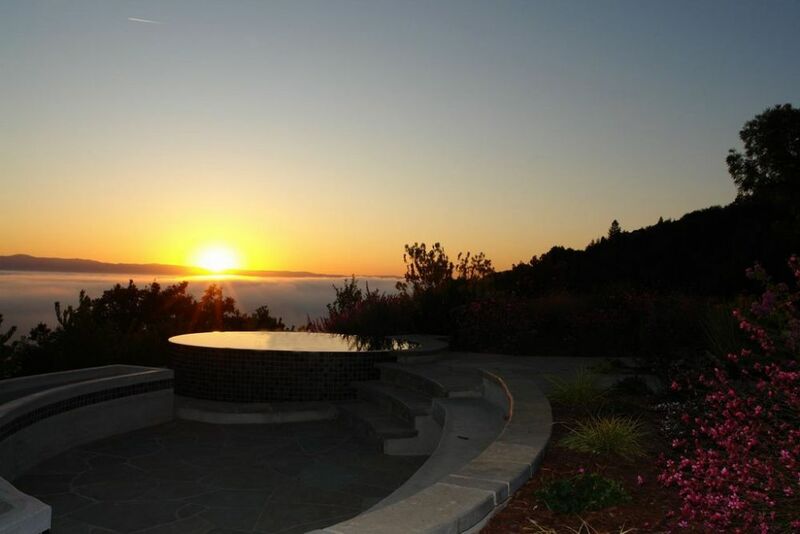 The new spa is finished with a gorgeous blend of glass tile and enjoys a great view off into the distance, day and night. It’s satisfying to know that we not only built a great watershape and a spacious, well-planted deck, but also saved our client’s house from any further damage related to the creeping slope. To be sure, this project cost the homeowner more than he’d intended. But now he has a beautiful spa in a spectacular hilltop setting, a great deck area, a fantastic kitchen garden – and, by the way, a house that is now back on a solid foundation.